During the four decades of my psychotherapy practice, close to 90 percent of my patients have struggled with eating disorders. Most have arrived in my office as therapy "veterans" who have already been around the treatment block, in some cases for months or years, in and out of multiple treatment milieus and therapy relationships, where they have met with partial or otherwise unsuccessful outcomes. Time-worn and weary, they bring a learned sense of failure, frustration, and defeat from their past struggles. Describing themselves as "a day late and a dollar short," they feel hopeless and fearful about their capacity for change, unprepared to tackle the tasks of ED recovery in the face of a disorder that compromises life quality, internal resources and emotional development. Parents of ED patients, guilt-laden about their own 'failed efforts,' typically believe that their child's eating disorder is incurable, and fear for the child's very survival. Doing What Works promises to alter this picture, to change the face of ED treatment; in so doing, it offers hope and recovery to so many sufferers. The field of ED treatment is still in its adolescence, as are so many of our patients. ED treatment techniques continue to evolve, leaving practitioners at a loss for what may be considered "best practice" principles and how to apply them. In the face of the treatment field's crisis of identity, clinicians find themselves very much on their own, seeking to find their own way as formal training mechanisms continue to elude us. Our work is at once enriched, and compromised, by the divergent viewpoints of clinicians and researchers and by a sense of benign chaos that arises out of an immense yet diffuse diversity of approaches, limited resources, and in some cases, personal biases and misunderstanding of ED and their unique requirements for treatment. Whether you specialize in ED treatment, engage with an occasional ED patient, or choose not to treat ED at all, every therapist, nutritionist, medical doctor, psychiatrist, physical trainer and school counselor should be prepared to recognize their elusive signs, address their urgency, and refer the patient for care. Highly lethal disorders leave little margin for error in diagnosis and treatment; the earlier these diseases are recognized, the better the prognosis for recovery and the possibility of prevention. ED are likely to exist as undisclosed co-occurring syndromes underlying other conditions for which the patient does seek care. Patients, families, friends, but most of all, practitioners need to recognize and understand the risks of allowing ED to go untreated. ED are the most lethal of all the mental health disorders, killing from six to 13 percent of their victims, 87 percent of whom are under the age of 20. The sad irony is that these diseases all too frequently go unrecognized by doctors and therapists. When they are treated, more often than not they are treated ineffectively. When treatment does not work, the finger of blame invariably gets pointed towards the disease itself through the misconception that eating disorders are 'incurable;' towards an 'impossible to treat' patient population; or towards parents of child patients for having caused the problem or for not addressing it sooner. The reality is that when treatment outcomes are less than successful or when they fail, it is all too frequently not the patient or family, but the well-intentioned (and otherwise competent) health professional who drops the ball through acts of misunderstanding, commission or omission. That, of course, is the best news of all, being that it is within our capacity as professionals and as human beings to learn and to change. Though treatment failure with ED is often the result of biological, neurological or environmental factors that lie beyond the practitioner's control, most treatment tasks lie clearly within the purview and capacity of the psychotherapist, the patient and the ED treatment team to solve. Even when competent in the general practice of psychotherapy, most therapists are untrained and unprepared to recognize and face the unique requirements and challenges that set this treatment specialty apart. Unfortunately, there are precious few places where clinicians can go to learn the science of this art. Current literature in the field focuses on evidence-based research, ignoring the application of this research to clinical practice. By failing to recognize what they do not know, practitioners typically resort to 'default' modes of care, doing what they know best, which may or may not effectively apply to the treatment of ED, the costs to patients and families are exorbitant, and opportunities lost; tragically, in some cases, leading to lost lives. Students and novice ED practitioners hunger to learn what to do with these patients. Trained clinicians who already bring skills and mastery to the task seek to hone their skills and learn more. By offering a meaningful and practicable system of care, this book douses the fires of professional fear and resistance to ED treatment, inspiring enough interest and know-how within the treatment community to fill the shortages in the treatment ranks with competent ED experts. It also encourages dialogue between practitioners and among researchers and clinicians, facilitating the collaboration of existing resources within our communities.
" Doing What Works educates and empowers clinicians who have been reluctant to treat disorders, while offering affirmation and legitimacy, alternative treatment solutions, and a novel perspective, to highly experienced and seasoned ED practitioners.
" It provides a unique opportunity for the multi-disciplinary treatment team to better understand and facilitate each others roles, enabling enhanced collaboration.
" It provides parents a practicable bird's eye view and understanding of treatment dynamics, preparing them to know what to expect, (and what to demand,) in their role as advocates for their child's care.
" Doing What Works integrates what we know, and establishes what we need to learn, in finding a better way to treat ED.
" Highlight the professional's use of self and relationship on the front-lines of care, harnessing the provider's internal strengths to evoke the patient's optimal potential. The contents of this book go beyond knowing to doing; beyond formulas to directives for action; and beyond knowledge to wisdom; in seeking outcomes. The book offers professional readers practical, usable, behaviorally-based tools ironically similar in nature to those that professionals seek to offer their recovering patients. Most significantly, the book fosters healing connections, horizontally, between the recovering patient and the world around her as she socially and emotionally re-unites with loved ones and reality; and vertically, by accessing the patient's connections to the strength and potential of her own resourceful self. As a treatment 'GPS' mapping out the most accessible and workable routes, Doing What Works alerts and prepares the entire multi-disciplinary treatment team, including patients and parents, to anticipate and bypass inevitable detours and pitfalls intrinsic of ED treatment, securing a smooth journey through the tough passages of a complex recovery. The concepts and protocols discussed in this book will not guarantee unconditional and timely success in treating ED patients; such guarantees are antithetical to healing ED, and to life itself. The proposed guidelines are offered merely as approximations, as each treatment situation demands unique responses to the unique requirements of unique internal and external variables. Once having created the structure of care, the therapist is free to diverge, extrapolate, augment and accommodate to meet the unique needs and requirements of the patient, therapist, family, recovery, and dynamic of the therapeutic moment.
" Offer an integrative start-to-finish, sequential, step-by-step system to approaching and treating the ED patient and family; it does so through the singular voice of a treatment expert who has facilitated many hundreds of ED recoveries throughout the past four decades.
" Bridge the chasm between the worlds of science and practice in the application of research outcomes to clinical practice through an integration of treatment approaches.
" Offer ED professionals insights and opportunities for personal growth as a prelude to furthering professional growth.
" Systematically provide guidelines for multi-disciplinary professional team function through sequential stages of care.
" Introduce innovative treatment concepts in ED care that include the "science" of human relationship and the mind/body connection, as validated by the newest discoveries on the frontiers of research about brain plasticity. In the interest of space, I have limited my discussion to those aspects of care that have particular relevance within the context of the clinical encounter. 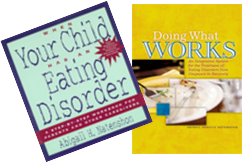 Citations and resources provide the interested reader the opportunity and motivation to pursue their own continued learning in greater depth. My focus in this book is on the work of the out-patient therapist functioning as part of a larger outpatient treatment team, though the principles offered will be relevant to in-patient clinical teams as well, and to all the disciplines that are represented within the team. Be aware that purely for purposes of convenience, throughout this book I refer to the patient as 'she' and the practitioner as 'he.' Please indulge this device, recognizing that though the majority of eating disorder practitioners are female, at least one in ten eating disordered patients is male. The information I present here pertains to patients of all ages, to adults as well as children; because integrating parents into the child's treatment and recovery process is so critical, the majority of my references will be to child, adolescent and young adult patients. Each chapter is designed to be read sequentially, or to stand entirely on its own. 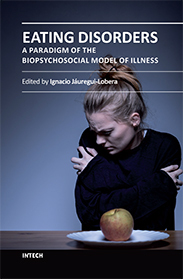 If read sequentially, the book follows the order of the diagnostic, treatment, recovery, and post-recovery processes, tracing the evolution of these disorders from their inception through the evolving stages of their recovery. Throughout every stage of the process, the fabric of healing functions is intrinsically woven together with a discussion about the clinician's unique use of self in evoking and optimizing them. An extensive use of case scenarios illustrates treatment concepts and theories, making this book a source of 'virtual' case consultation for professional readers who will inevitably see themselves and their patients in the cases and personalities presented. These cases are designed to stimulate contemplation and learning in the reader's inquiring mind. In reading the case examples, you may have chosen a different path. Because there is never one 'correct' solution to problems of this complexity, the standard for measurement for success will be the patient's continual movement forward towards goals that are clearly intentional, purposeful, defined, directed and operational. As readers become increasingly adept at treating these disorders, they will discover that "re-reads" will offer an ever-increasing depth of knowledge and understanding as so much of what this book brings to you is dependent upon the professional experiences that you bring to it. Where examples are cited from my own clinical practice, patients' identities have been protected and incidents disguised through the use of fictitious names and through changing circumstances. This book is a 'must read' not only for therapists, nutritionists, and medical doctors, but also for patients, parents and families who need to join forces with treating professionals to mentor their own or their loved one's recovery. The author's reassuring voice resonates with 40 years of specialty experience and know-how, providing therapists the permission, incentive, vision and confidence they need to become self-starters within a demanding treatment process---and to help their patients do the same. In the treatment of eating disorders, a great deal is at stake. Clinicians are capable, and in fact obligated, to stop at nothing to achieve their goals of helping patients and families to stop at nothing in achieving theirs. The bottom line in the treatment of ED becomes healing - complete and sustainable. It is for us to learn how, when, and in what manner to put together and offer the techniques and skills that we already know; how to nuance the quality of our care-giving with mindful action, and clearly defined intentionality; and how to make loving human connections with our patients, brain to brain, soul to soul in connections that are themselves truly healing. By impacting the patient's emotional development, problem-solving, quality of life and physical function, self-regulation and self care, the work we do holds the potential to become transformational, saving and restoring lives and life quality now, and for generations to come.